Spring Break 2013. Yes, the old troll goes to school–Phoenix College where I take usually one or two courses per semester. I had just finished my mid-term exam in Microsoft Office products (and I think I got an A, but I know I have at least a high B. ), and I thought about how millions of college kids would be going off to party through the week, and I decided to take a trip. My youngest brother, Henry, has been inviting me (for the last 10 years at least) to come visit him in Utah, and I never did it. On the spur of the moment, I decided that this would be a good time. After a couple of phone calls that verified it would be okay with Hank to come see him now, the trip was on. I wouldn’t go alone, but would also take my son James to help with the driving and the photography. The rest of this fairly long blog is going to be mostly pictures that James or I took as we traveled, and I mean that literally. As an experiment, I tried taking some pictures from inside the car as we were moving. They didn’t look too bad. If there’s a little blur to some of these, you now know the reason. If you don’t like family vacation things, stop reading now. Thanks for stopping by. Keep reading and you’ll gain a few insights into my personality, for whatever good that might do you. 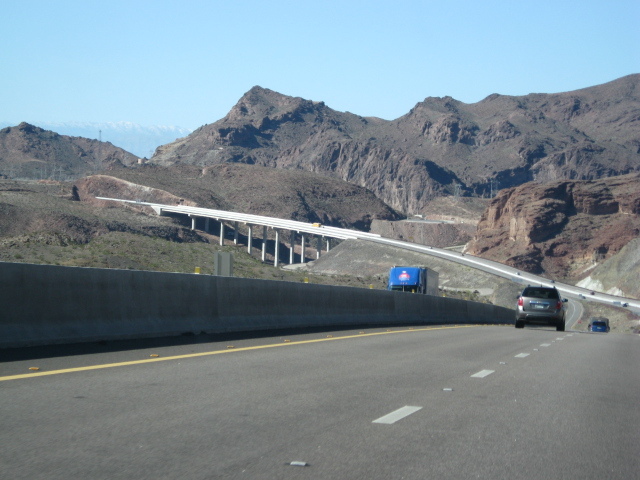 Since we were heading north, and since Bear warned me that there was a road blockage/collapse on the way to Utah, I decided to go by way of Las Vegas where my daughter Jillian lives with her husband Nick. I saw her last at the end of November, and it’s good to see the kids once in a while. 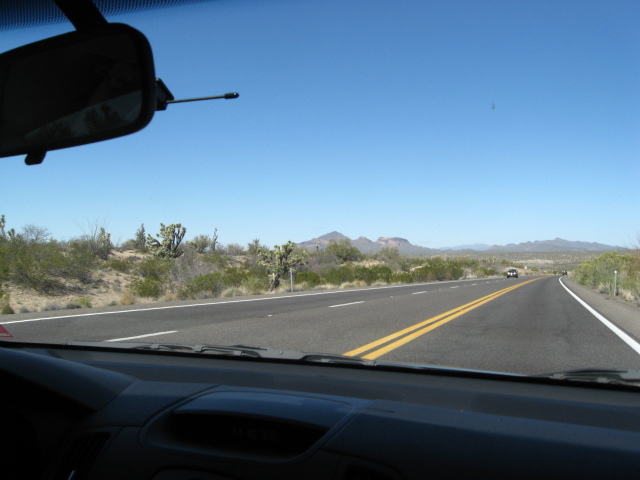 We got off on the wrong foot by forgetting to take a picture of us getting into the car as we left Phoenix. Now begin the pictures with fhe first one I did think to take. Heading west near Lake Pleasant north of Phoenix. We tried taking a picture from a moving vehicle looking straight ahead. 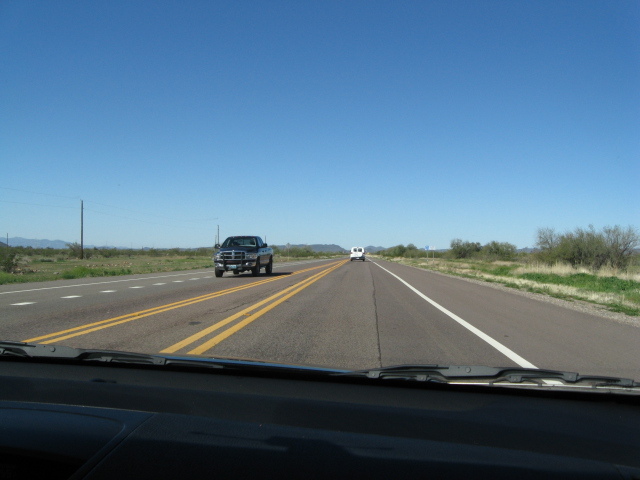 Blue skies of Arizona. The desert gets bumpier. Still bemused by the fact that this was working so well, I’m wasting shots I could have used on better scenery later. First stop in Wickenburg, Arizona for lunch. The town lives off tourism, and plays up its old west image. 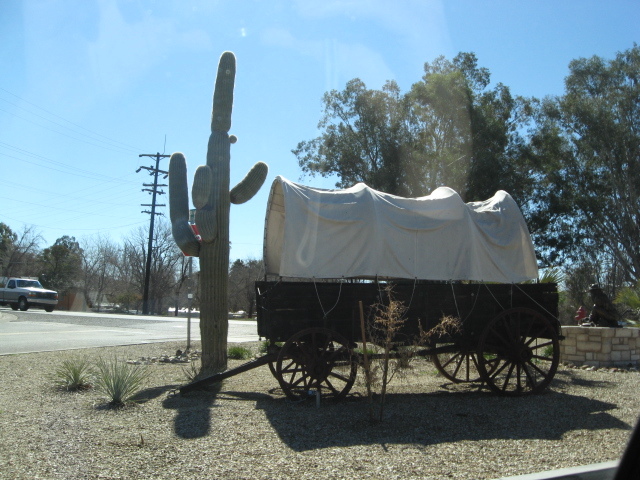 Covered wagon and saguaro cactus–what could be more Arizona? North of Wickenburg on the road to Wickiup, the road turned mountainous with strange vegetation. This is a forest of giant cactus trees, growing as much as twenty feet high, all thorns and prickles. They are called Joshua trees. 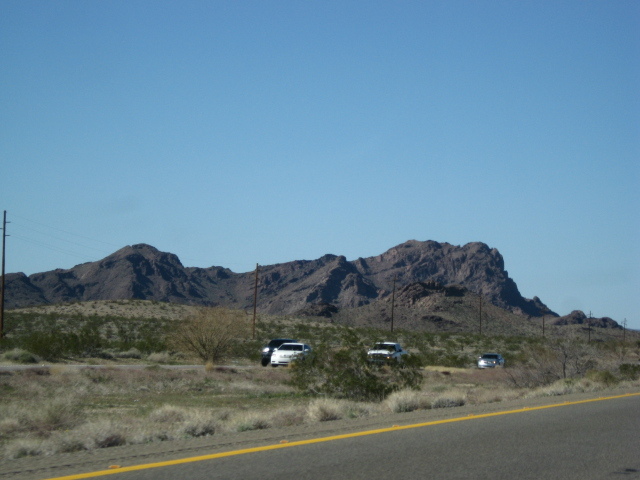 There is some rough terrain between Wickenburg and Kingman. 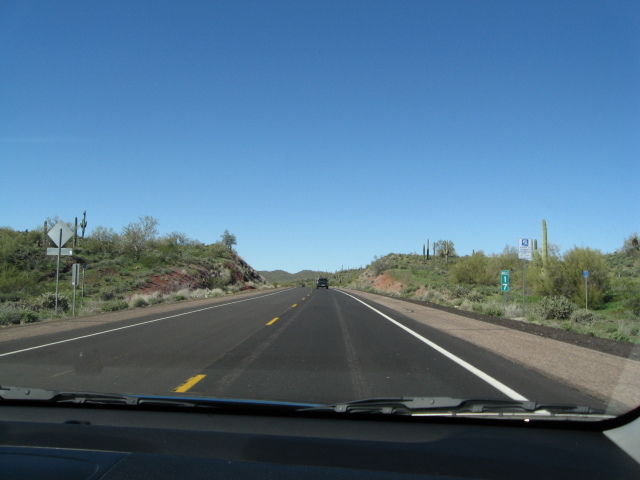 The highway, however, has been upgraded and is really nice. This is fun to drive. 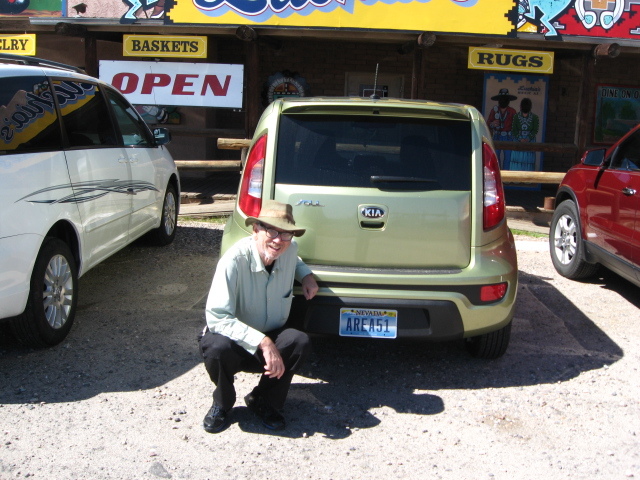 We stopped for a break at my favorite roadside attraction between Phoenix and Las Vegas–a trading post/cafe called Luchia’s that specializes in pie and Indian artifacts. Why am I squatting beside this car? Look very closely at its license plate. Science fiction weirdness follows me wherever I go. The front of the trading post is newly painted with kachinas. This is son James, who is quite proud of his newly grown beard, I think, posing with the God of Turquoise. 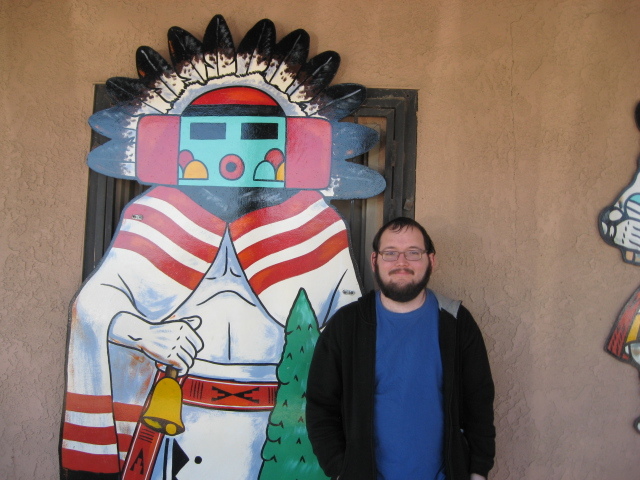 Really, I have no idea who this kachina is, but he takes a nice picture. 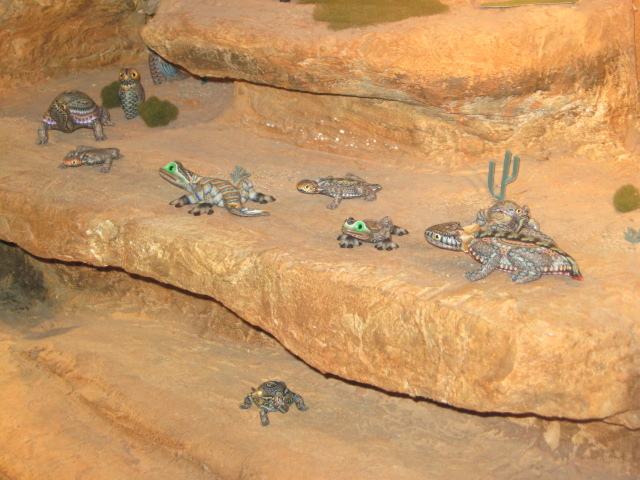 A wildlife diorama inside the post all done in handcrafted silver for the animals and plants. 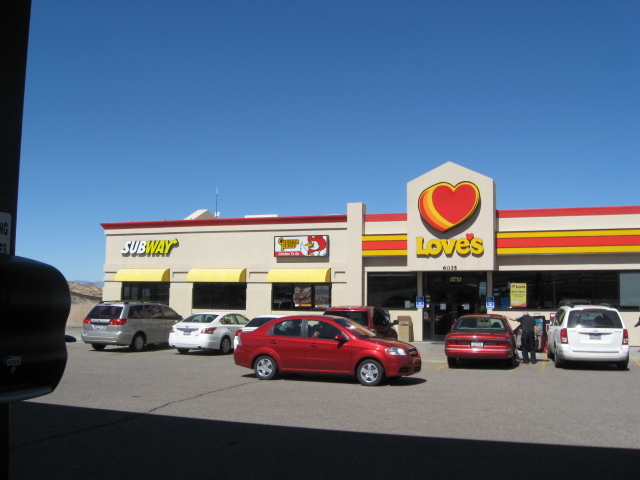 We stopped at Love’s truck stop before reaching Kingman. 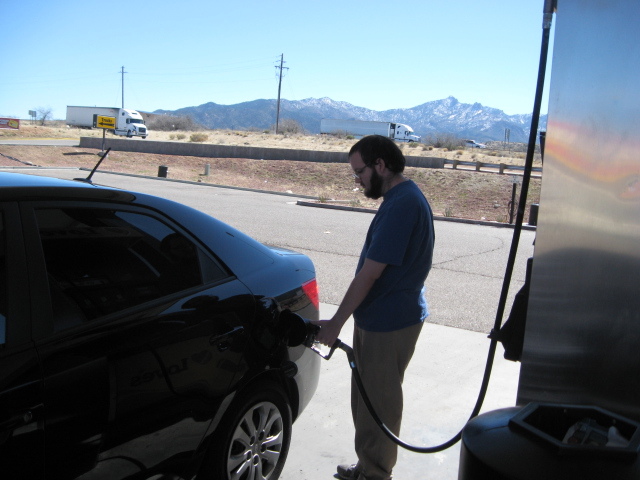 James is pumping gas into the car. I cleaned the windows. We also had lunch and played a few games of Magic. The best truck stops in Arizona look a lot like this. 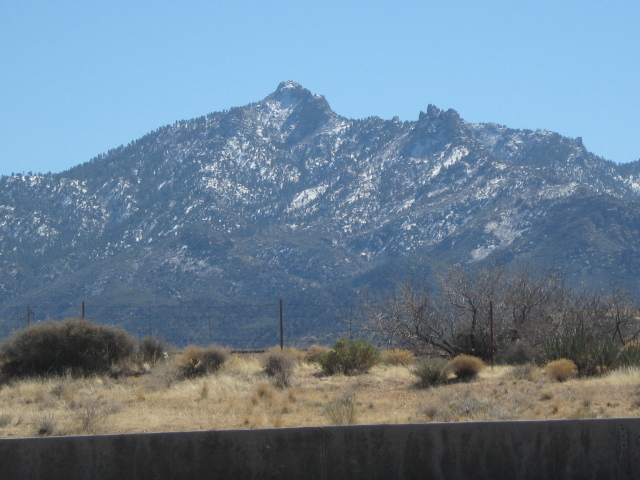 Snow on the mountains outside of Kingman, Arizona. It may seem commonplace to you, but I go for years in Phoenix without ever seeing snow. The watery white stuff is about to become the theme of this adventure. North of Kingman now and truly on the road to Vegas. 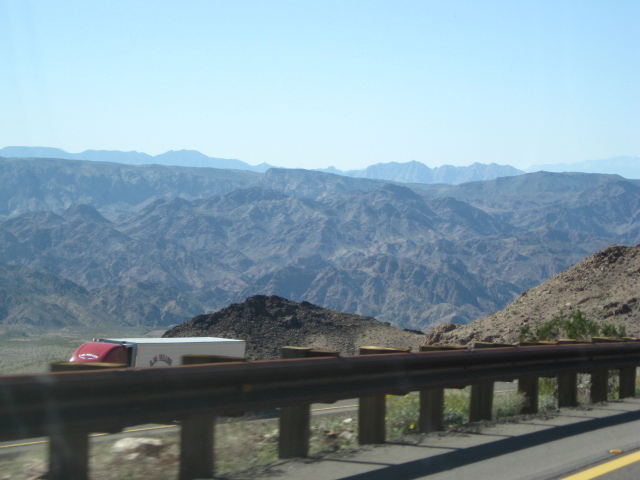 A poor view of the Colorado River Canyon before reaching Hoover Dam. 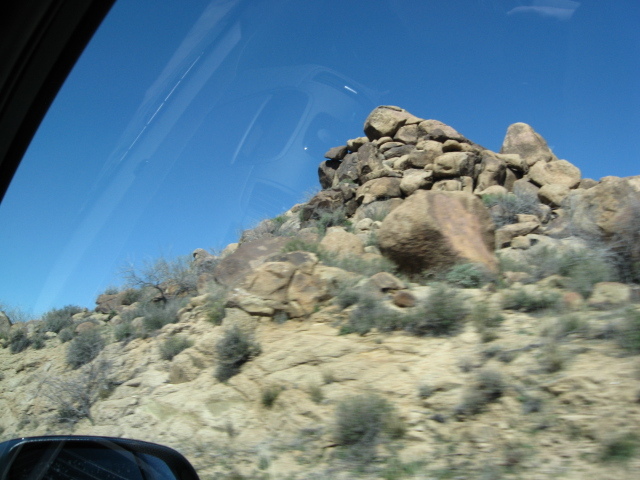 The area between Arizona and Nevada is some of the ruggedest country in the west. 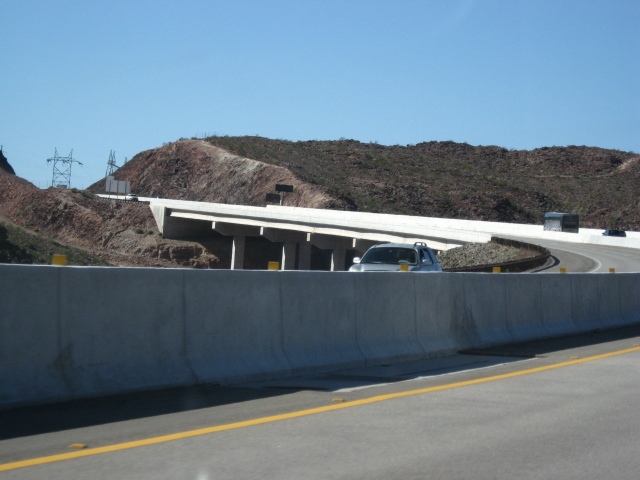 For a moment I thought I had got a shot of the new bridge that crosses the Colorado above Hoover Dam, but this is only a little one that leads up to the main bridge. You can’t get a picture of the really spectacular one when you go over it. There is nothing to see. A closer, better shot of the same nameless bridge. I wonder if it has its own troll. 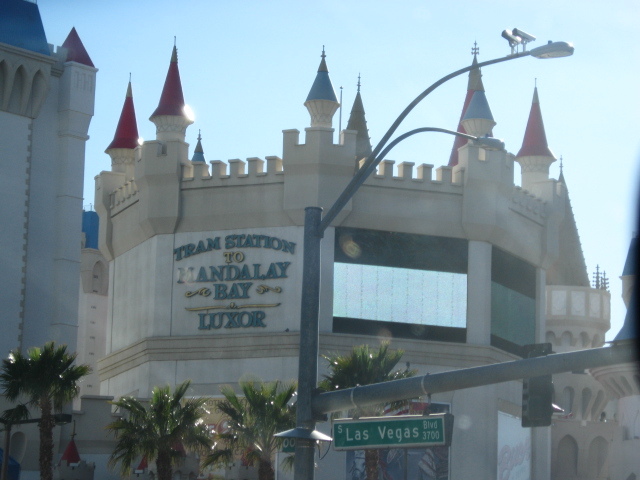 Nevada is famous for its casinos. This is the first one you see as you cross into the state. 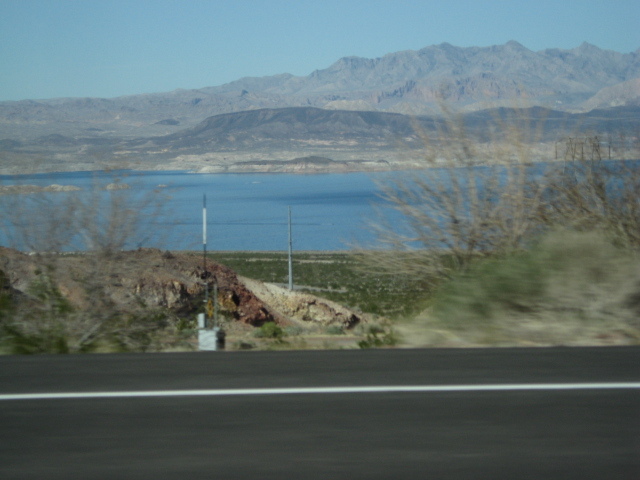 A distant view of Lake Mead. This manmade lake on the Colorado is vital to the water supply and electrical power of Nevada, California, and Arizona. 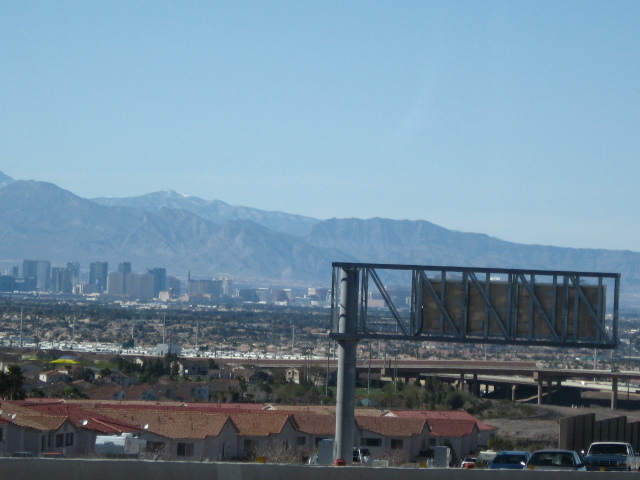 Coming into Las Vegas. We have been driving for most of the day, and are glad to see that the end is in sight. Lost in Las Vegas. We had a little trouble finding our motel. Freeway driving in unfamiliar cities is so much fun! I find our place to stay for the night. Nothing but the best for the St. Andres on the road. Oops! I thought I was in Las Vegas. How did I get to New York? The motel was in the very heart of downtown Las Vegas so we walked around and did a little sightseeing. 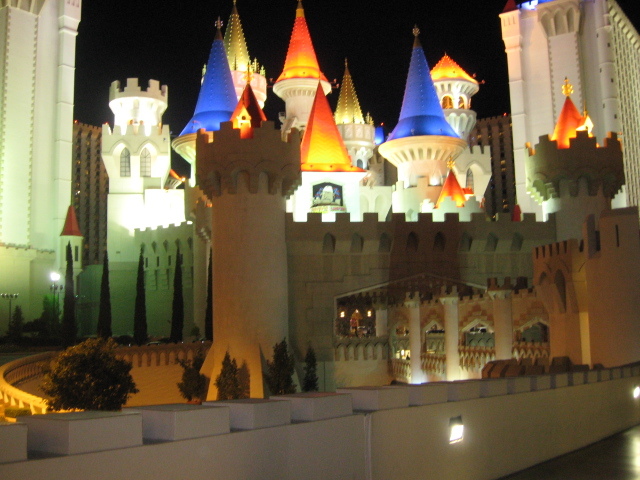 This casino is called Excalibur, but they got it all wrong. King Arthur’s sword was Excalibur. His castle was Camelot. Wrongly named, but very pretty. 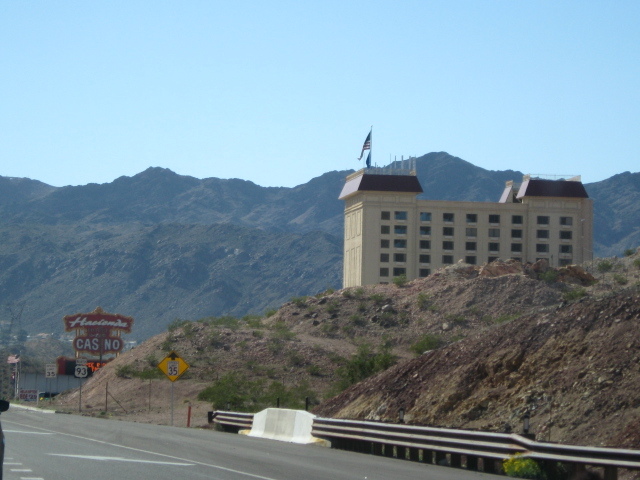 With our room secured, James and I went off to see his sister Jillian a few miles northwest of downtown Vegas. She has a nice home in the suburbs with her husband Nick and friends Todd and Steve. It is a model for the new extended family of 21st century America, a sharing of resources that none of them could afford on their own. 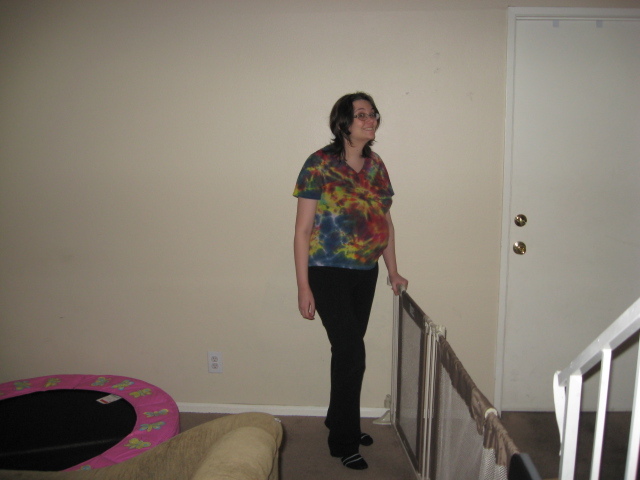 This is my lovely daughter Jillian, 8 months pregnant, and about to make me a grandfather for a second time. She reluctantly agreed to be in this travelogue. Greenlee is 2 years old now, and such a cutie. 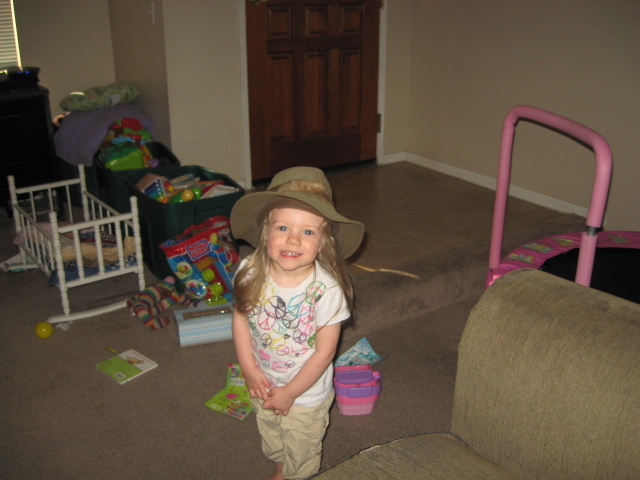 Last time I saw her I teased her with my hat, popping it on her head just to watch her throw it off. This time she accepted the Trollgod’s hat quite calmly and wouldn’t give it back until she tired of it. I think she looks better in it than I ever did. 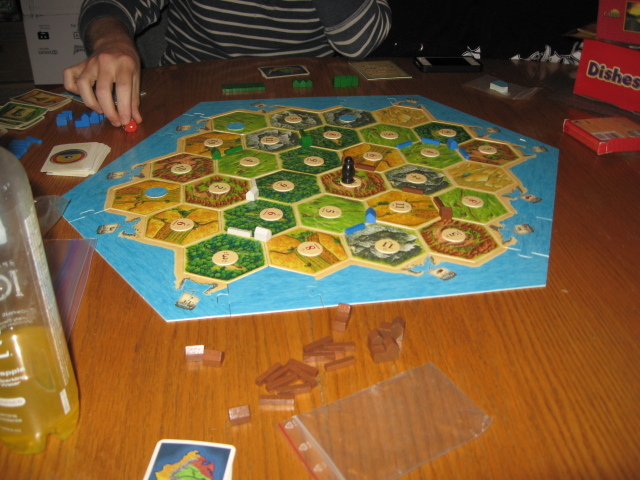 I might claim it was to visit family, but the real reason for going to Vegas was to play Settlers of Catan. I talked them into playing a randomized setup version, but couldn’t get Tod and Steve to try the “pick your own number instead of rolling the dice” variant that I created. Tod won this game. I was crushed. 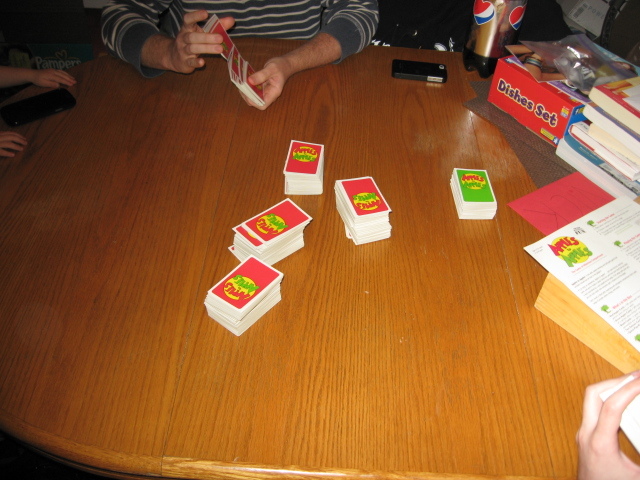 And we followed Catan with Apples to Apples. Jillian won that game. I came in second. 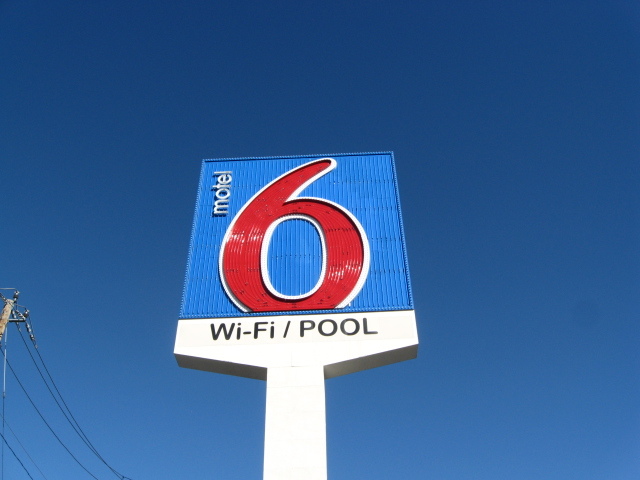 When the games were over, James and I left Jillian’s place and went back to our motel. We still had time to do some sightseeing. After walking all through the Hooters Casino that was next to our motel, we went upstairs and entered Excalibur on the second level. 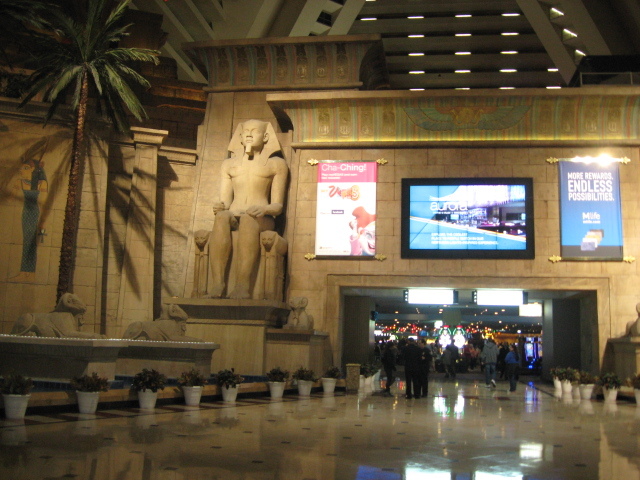 We found colossi sitting inside the black pyramid that is the Luxor casino. We walked through a Fun Dungeon at one point–entertainment for kids. The slot machines and gambling tables didn’t appeal much, but the displays were magnificent. This was like a personal message from the universe and a bit of validation for me. 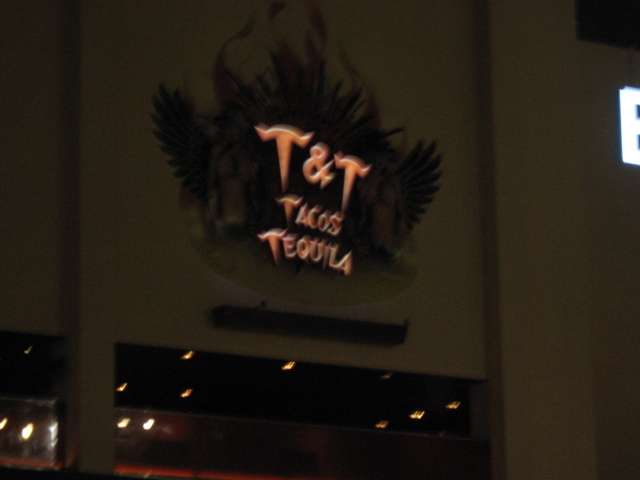 Anyone interested in a Tacos and Tequila roleplaying game? 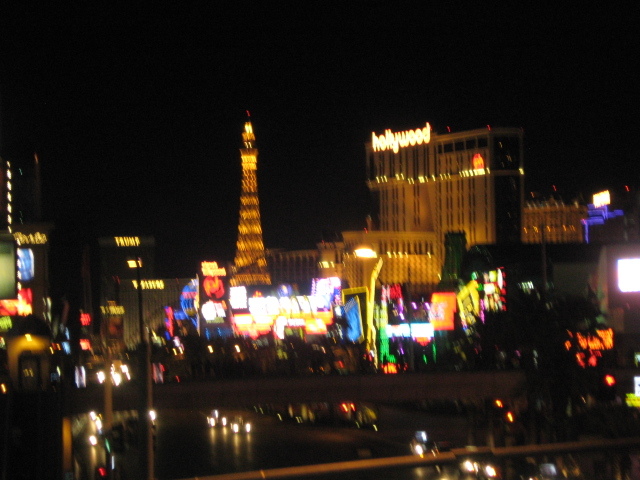 More of Las Vegas by night. It is a spectacular place from a distance. After a couple of hours of walking around gawking, but not gambling, we returned to our motel and went to bed. The plan was to get up early on Monday morning and drive through most of Utah to reach Salt Lake City by Monday night. If you have enjoyed being on this road trip with me, or have anything to add about the places i’ve visited, please leave a comment. And come back in a day or two when I do Road Trip, Part 2. My spam email is full of messages saying “Lucky you, you’re going to Las Vegas.” Because I’m fairly close to Las Vegas, I do like to go there once in a while. Actually I went last week. Visited family and played a lot of games. Only got into a casino once on Sunday just before I came home again. Lost about $5 playing video poker. I’m not really the last of the big spenders. 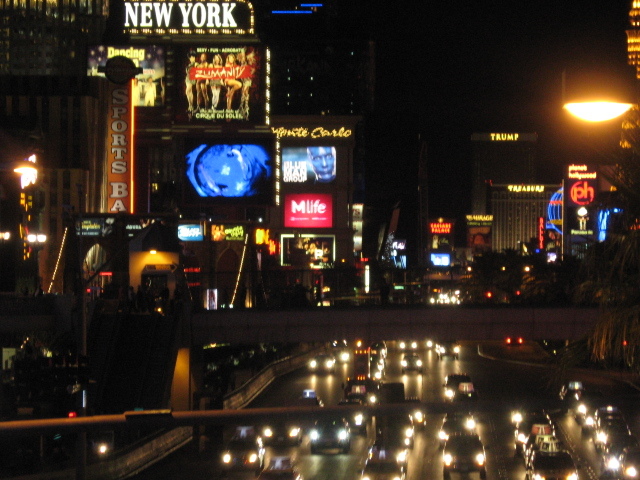 A fun thing that I did on Saturday night was cruise up and down Las Vegas Blvd. which is known as the strip. Alas I forgot to bring my camera on the trip, but there should be an internet picture I could use. 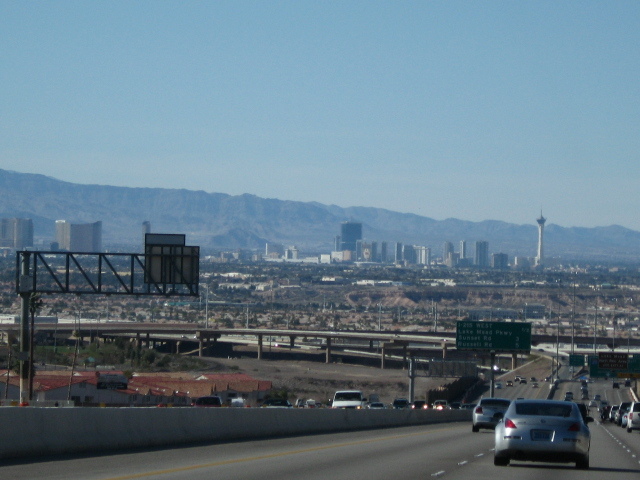 It was a long slow ride up and down the strip in bumper to bumper traffic, but fun. When I checked out of my hotel, I picked up some flyers for other attractions in Las Vegas. Here they are: 2 reasons to return to Las Vegas. 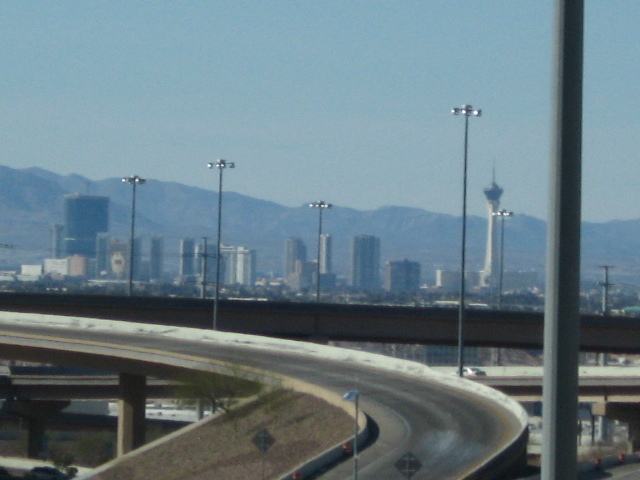 If anyplace deserves a Zombie Apocalypse, it’s Las Vegas! I am not a big fan of zombies, but I would have gone there. Do you think it’s the kind of place where one could take a date? 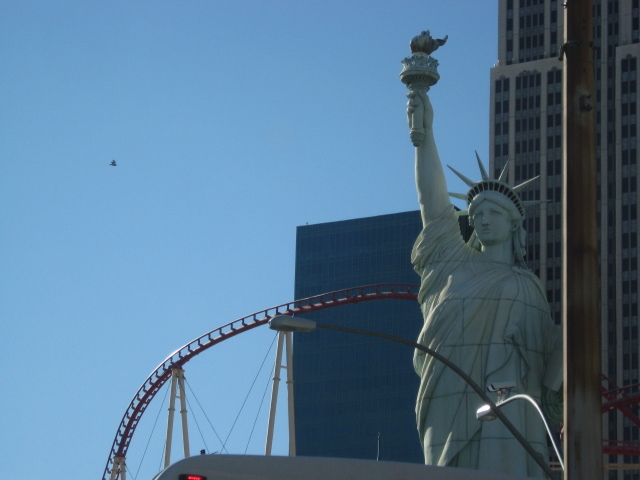 If you ever visited Las Vegas or saw anything weird there, why not leave a message?